Saint Petersburg - Let The New Era 2012 IZOD IndyCar Series Begin! Let the new era of unified American Open-Wheel Racing (#aowr) begin with the temporary street course Honda Grand Prix Of St. Petersburg. This year, 2012, will go down as the first year that American open-wheel racing is truly unified since there are no excuses that were first raised when the merger happened suddenly at the beginning of the 2008 season. Everyone will be competing on new Dallara DW12 equipment, with a choice of three new turbo-charged 2.2 liter engines, on tracks that are the most favored by fans of both series. The season will favor street/road courses as opposed to NASCAR styled ovals and the oval tracks featured in this truly unified season are, for the most part, ones made famous through the sport of open-wheel automobile racing. The first oval race on the schedule is the grand-daddy of them all, The greatest specticle on all of autosport, the Indianapolis 500 - May 27, 11:00AM ET - ABC Sports. Next will be the high-banked, super high-speed Firestone 500 at the Texas Speedway. This track holds a string of closest finishes in open-wheel racing. Broadcast set for the night of June 9, 8:00PM ET - NBC Sports. 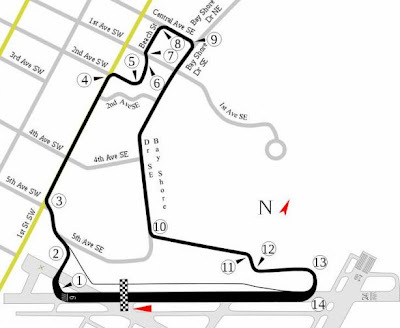 Third comes the Milwaukee IndyFest, West Allis, WI - run on the famed flat four-cornered bull-ring of a track near the Wisconsin fairgrounds. This race venue was saved by the Andretti family primarily because of the history this track holds as a contrast to all other oval tracks ever run. This track was originally a flat dirt track that transformed itself into a concrete ring that challenges drivers with close quarters and the challenge of virtually no banking. Broadcast set for June 16, 1:00pm ET - ABC Sports. The Iowa Corn 250, Newton, IA - represents a hold over from the Indianapolis Racing League days and gives a nod to the corn based Ethanol fuel that powers these 2.2 liter turbo-charged Chevrolet, Honda, and Lotus engines of this modern era season. In order to spice things up, this race will be run at night under the lights as they do in Texas. Broadcast set for June 23, 8:00PM ET - NBC Sports. The last oval race of the season happens to be the final race of this 16 race benchmark of the modern era in American Open-Wheel Racing. This track holds the speed records for racing of any kind on a closed course for both qualifying and at race lap speeds. Yes, the venue is the Auto Club Speedway (formally, California Speedway) at Fontana, California. On October 28, 2000, during CART qualifying, Gil de Ferran set the track record for fastest lap at 241.426 mph (388.537 km/h), breaking the record (240.942 mph) set by former F1 driver, Maurício Gugelmin (PacWest Racing) who went even faster -- 242.333 mph, to be precise -- in practice. Mark Blundell, also a former F1 driver (PacWest Racing - Gugelmin's teammate), was originally credited with the fastest "at race lap" speed record with a lap at 237.000+ (lap time unknown). Wikipedia shows that Greg Moore actually set fastest lap during the race on lap 80 with a time of 30.900 sec. over the 2.029 mile D-shaped oval (awaiting email clarification from Auto Club Speedway). All of these times are suspect as official by the FIA due the measurement of the track at being slightly longer than exactly 2.0 miles, but the recorded speeds recorded are factual. What is not in dispute, however, is that the 2003 IndyCar race held at Fontana (the Auto Club Speedway) was the fastest closed-circuit race ever in motorsport history, with an average speed of 207.151 mph(333.306 km/h) over 400 miles (640 km) by Sam Hornish Jr. The 2012 race broadcast is set for a dusky night-time ending, September 15, 8PM ET - NBC Sports. This weekend features a temporary street course e set up in the Florida city of Saint Petersburg first run under ChampCar (CCWS) sanctioning in 2003. 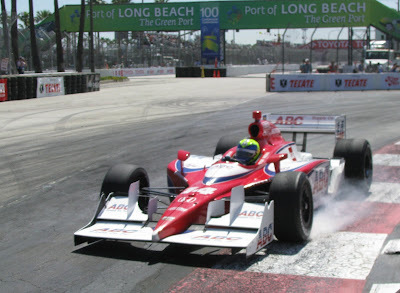 After a one year break in order to regroup, the event was resumed with the sanctioning of the Indy Racing League (IRL) from 2005 to the 2007 and continued uninterrupted after the merger of CCWS and IRL as today's IndyCar beginning in 2008 through to today. Past winners of the Honda Grand Prix Of St. Petersburg event are as follows: Paul Tracy (2003), Dan Wheldon (2005), Helio Castroneves (2006 and 2007), Graham Rahal (2008), Ryan Briscoe (2009), Will Power (2010) and Dario Franchitti (2011), Team Penske is the most successful with 4 wins ... track speed record is held by Sebastien Bourdais (McDonalds/Newman-Haas), set competing in ChampCar (2003) when he qualified for the pole, besting Paul Tracy (Players/Forsythe) with the time of 1:00.928 as his Lola-Cosworth turned an average of 106.472 mph. A field of 26 drivers -- listed below -- are expected to take to the track for the race set to start Sunday, March 25, 12:30PM ET broadcasted to national network TV audience by ABC Sports. Target Chip Ganassi Racing's Scott Dixon set first ever mark in an event for the new DW12 formula as he was fastest in the first official practice session of 2012, leading Team Penske's Ryan Briscoe by 0.4784 seconds. Briscoe's teammate, Will Power, ran third, posting a lap of 1:03.57 around the 1.8-mile, 14-turn street course. Dario Franchitti served as a bookend for the Penske duo, placing fourth with a lap of 1:03.60 seconds. 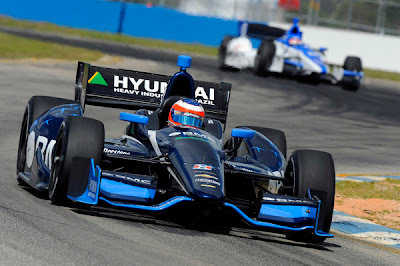 Schmidt Hamilton Racing's Simon Pagenaud rounded out the top 5, turning a 1:03.64-second lap in hot, humid conditions. Honda engined-cars placed 1st, 4th, 5th, 6th, 8th and 9th, with Chevrolet runners occupying the rest of the top 10 slots. The fastest Lotus-engined car was Oriol Servia's DRR entry in 19th with a lap of 1:04.29. The session was mostly trouble-free, barring Charlie Kimball's nose-first crash at Turn 10 with less than five minutes remaining in the session. With so little rubber down, times are expected to drop throughout the weekend. Team Penske’s Will Power nearly matched his pole speed from last year in only the second practice session of the weekend, leading Briscoe and Franchitti. Will Power breaks his own track record by 0.2305 (old mark = 1:01.6026). Teammate Ryan Briscoe nails down P2 by breaking Will Power's old mark as well. The top five positions on the grid are held by Chevrolet powered DW12's with seven of the top ten grid positions being filled by the new era engine supplier over longtime supplier and race sponsor, Honda. A less than competitive showing by the cars powered by the Lotus/Judd effort with the highest placing driver of the "Lotus Legion" (highlighted in BOLD below), being one of the most consistent performing drivers of the series, Oriol Servia. Probably the biggest surprise of this first qualification session of the new formula 2012 IZOD IndyCar Series season is that even though cars fielded by Target Chip Ganassi Racing did very well in practice, the highest placing car from the Ganassi stable was Scott Dixon in P7 - none made it into the Firestone Fast Six qualifications round. Team Penske had 3 cars, Andretti Autosport had 3 cars - 2 in the Firestone Fast Six round, Ganassi had only 2 cars, Kingdom/Schmidt-Hamilton had it's one car effort place P6 in the Firestone Fast Six, and KV Racing Technology with only one car rounding out the top ten positions on the grid. A short memorial for the late Dan Wheldon, who made St Petersburg his home, preceded Sunday’s race. On Lap 73, Castroneves gets far outside, breaks as deeply as he can and passes Dixon on Turn 1 for second. “It was awesome because the car (stuck), and I was like, ‘Yesss!’ ” said Castroneves, who soon after passes Hildebrand. By Lap 80, Castroneves’ lead on Dixon grows to more than five seconds. Hunter-Reay, in third, falls seven seconds behind Castroneves as his crew implores him to conserve fuel. E.J. Viso, on the brink of dehydration following an overnight bout of food poisoning, is fifth — seven places ahead of his starting spot — 93 laps into the race before a final pit stop ultimately drops him to eighth. His lead edging closer to insurmountable, Castroneves drives conservatively on the last dozen or so laps and wins by 5.5292 seconds. Most of the problems of cars not finishing had to do with electrical gremlins on a car most engineers are still trying to figure out. 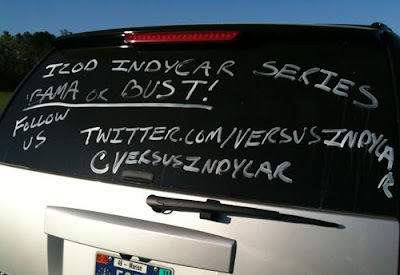 So, the new era 2012 IZOD IndyCar Series (#indycar) has begun at the Honda Grand Prix Of St. Petersburg (#gpstpete) — Twitter #hashtags included! Is Lotus Having Trouble Delivering DW12 Engines? Is the first race of the season through the streets of Saint Petersburg in jeopardy for teams that use the newest of engines developed for use in the IZOD IndyCar Series for 2012? brant james@brantjames - Says SebastIen Bourdais: he expects to race in @GPSTPETE #indycar but his Dragon Racing car currently no Lotus engine. Disconcerting? yes. Is this just an issue with Seabass's DW12 or is this portend a wider problem with Lotus Dragon Racing and will this effect the second car on the team, the TrueCar sponsored DW12 driven by Kathrine Legge? Will this situation effect the rest of the teams (Bryan Herta Autosport, Lotus Dreyer & Reinbold Racing, Lotus HVM Racing) that are using the Lotus/Judd 2.2 litre turbo-charged power plant? If Lotus engines are in short supply, how will this potential situation play out for the "Lotus Legion" for the balance of the 2012 season? Bourdais, a four-time Champ Car champion embarking on a full-time IndyCar season, told Autoweek that as of Wednesday morning, Lotus had not provided an engine for his car. He is entered for the Sunday race. He said he expects to participate. But he also expected to have an engine by now. Teammate Katherine Legge's engine is scheduled, he said, to arrive on Wednesday (it is assumed this engine arrived). Bourdais said team owner Jay Penske is “a victim in all this.” “[Lotus] told us they would have seven or eight engines by the first race. But since my engine is coming . . . I don't know when, either there are spare engines they don't want to give to us or they don't have any engines at all,” Bourdais added. “And that I don't know.” Dragon received just one engine during spring testing at Sebring International Raceway--and not until Wednesday night of the four-day session--severely limiting both Bourdais and Legge's test time. “It definitely doesn't get us anywhere near where we want to be,” Bourdais said, adding that he and Dragon “expect nothing” results-wise from the opening weeks of the season. Bourdais said his team is funded for a full campaign, but he will not race at Milwaukee on June 16 because of a commitment to race in the 24 Hours of Le Mans. between people using machines of motion. Some write stories, some splice scenes from images captured in stills and video, while others capture observations registered in New Media posted on the internet via blogs, 140 character notes submitted to Twitter which are known as "Tweets", and emailed PDF's. 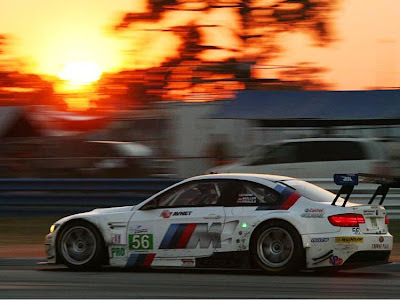 The following entry are observations registered in New Media posted on the internet for Saturday's 60th Anniversary Mobil 1 12 Hours of Sebring. What rotten luck for JRM, Dumbreck/Brabham/Chandhok. :( Suspension failure after running 3rd. 9:30 p.m. ET: One hour to go and the GT battle is heating up. JanMagnussen takes over the class-leading Corvette, but makes two mistakes--the first by putting it in reverse when trying to pull away, then cruising out of the pits and onto the track too slowly, letting the No. 51 AF Corse Ferrari get by. Paolo Ruberti (#88-GTE-AM Porsche 911 RSR 997) “We are really happy to win the first FIA WEC and the 12 hours of Sebring. It's like a dream. The car was perfect, we had a bit of trouble in the last hour. I did the last stint without the power steering. I kept the car on good pace with a good results. The Ferrari is a little faster than us, but we were in fact in the best position. In this place we need to now finish all the races for a good results. The return of Aston Martin Racing in GT (with Stefan Mücke, Adrian Fernandez and Darren Turner) shows promise for the English manufacturer in this class. 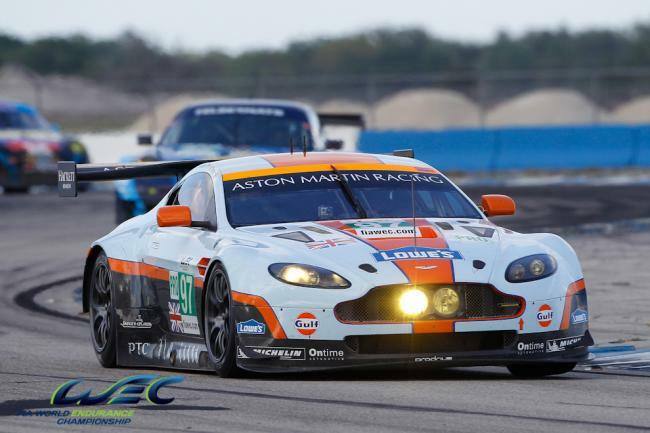 The #97 held the top spot in the GT class during the a round of pitstops with about 90 minutes transpired in the 12 hour endurance race. Update - 5:45 p.m. ET: Huge letdown for the No. 97 Aston Martin Vantage V8 of Darren Turner whose left rear wheel departed the car. Yellow flag for the stranded Aston which was running fourth on the same lap as leaders in GT-Pro. 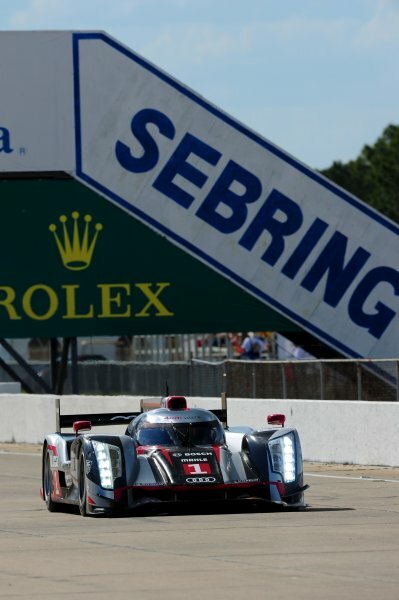 Qualifying for Saturday's 60th Anniversary, Mobil 1, 12 Hours of Sebring was held today and with little surprise in the overall standings, the diesel-powered Audi R18's took the top three positions with the three fastest times. 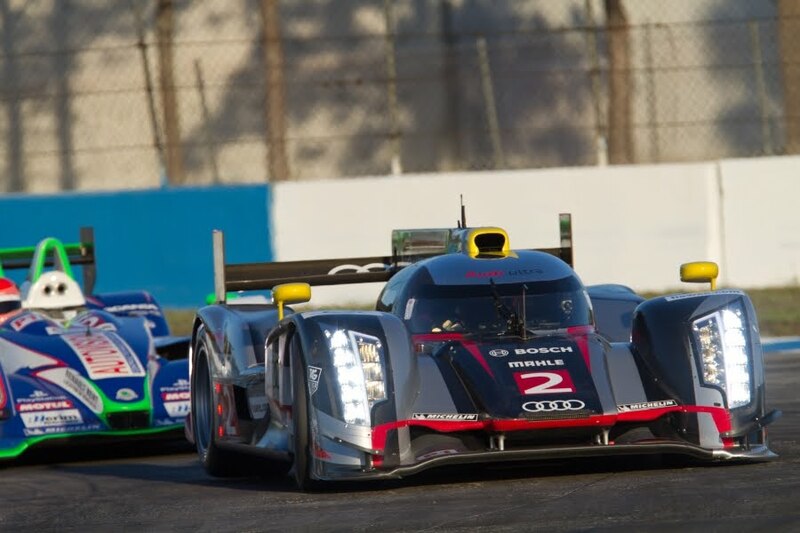 The cars qualified in car number-badged numerical order, with cars #1, #2 and #3 in grid positions 1, 2 and 3. Andre Lotterer (driving the #1 Audi R18 - pictured), the defending champion at the 24 Hours of Le Mans, showed what pace the cars could achieve with the overall and LMP1 class poles at 1:45.820. The race goes green at 10:30 a.m. ET on Saturday. Building on their successful partnership with Mazda, AER built an all-new version of the MZR-R race-winning engine for the 2010 season. Further refined and strengthened in 2011, the 2012 version has further advancements in virtually all areas. The 2.0 liter, four-cylinder in-line turbocharged engine was designed from a clean sheet of paper, and is designed to make in excess of 500 HP -- on a per cylinder basis, more than an F1 engine. It is all aluminum construction and mounted as a semi-stressed member of the chassis with A-frames. Here in 2012, this will not be your father's IndyCar ... or CART/ChampCar for that matter. Last year (2011) was the last year for a bunch of IndyCar-ism's, not the least of which was the continued running of a tired and old formula that utilized an old Dallara chassis that was optimized to work well on ovals and adapted for use (with many engineering and driver complaints) on road and street courses with all teams using the same naturally aspirated engine from Honda. The first year of the new DW12 Dallara chassis has a frame that has been designed to be more balanced for use on road and street courses and the teams will run turbo-charged engines manufactured from three manufacturers of Honda, Chevy, and Lotus. One of the strongest changes, however, concerns itself with the communications medium of New Media and the sub-set known as Social Media. To illustrate the change of visibility and understanding from the top when, during the announcement that F1 standout driver Rubens Barrichello was joining KV Racing Technology's three car team for the 2012 season, IZOD IndyCar Series CEO Randy Bernard went to one of Barrichello’s test sessions to meet the Brazilian. He said last Thursday it was an exciting day for the series ”and a positive step to start” the year. What Randy Bernard was alluding to was that Barrichello brings with him an ardent and strong New Media fan base … his 1.47 million followers on Twitter is one million more than Kanaan’s ... who leads all IndyCar Series drivers with 448,000 Twitter followers. So basically, as was written in the article titled "Brazilian Changing Of The Guard, Barrichello In As Meira Leaves IndyCar", what we will expect to be hearing from the PA speakers in the stands, at every 2012 IZOD IndyCar Series venue during the season is – "Ladies and Gentlemen … start your 'Tweets'!" The IZOD IndyCar Series has set an agenda to utilize the Social Media platform of Twitter that allows fans to communicate to one another in 140 character (or less) messages known as "Tweets". If one were to use their smartphone, iPad, tablet, or laptop to post the messages, and wanted to follow what others who were following the comments and on-track action of a particular race, all one would need to do is employ the search method of locating messages through the use of a "HASHTAG". A HASHTAG takes the form of an indexing tool utilized in real-time to send messages and look at messages on Twitter ... it opens the door to the discussion room of that IZOD IndyCar Series race so socially, we all can participate in the process. IndyCar fans can expect Twitter handles on race broadcasts, much stronger at-the-track Twitter presence and a set of event-specific hashtags in the 2012 race season. The series is also trying to provide teams with resources and expertise required to engage fans through expanding social media avenues including Twitter. Kate Guerra (@kateguerra4), public relations coordinator and manager of social media for IndyCar (@IndyCar), said last week NASCAR (@NASCAR) may have made a big social media splash in Daytona, but IndyCar also recognizes the value of social media like Twitter to engage fans and has been building its Twitter efforts since late last season. IndyCar has four primary social media thrusts planned for 2012. First, more integration of Twitter handles into race broadcast. Guerra said after she saw how SPEED integrated Twitter handles into graphics during the Rolex 24, she met with producers for ABC and NBC Sports who were very willing to do something similar on all IndyCar broadcasts. Second, Guerra hopes to create “hashtag communities” for each race. For example, leading up to and during the IndyCar race at St. Petersburg, tweets that include the event hashtag -- #gpstpete – will be collected under that tag. By clicking on the hashtag in your Twitter stream, you’ll go to a listing of all tweets that contain that hashtag. Third, IndyCar and Guerra continue to offer help and guidance to teams and drivers who want to up their game on Twitter. In that regard, Bernard invited Omid Ashtari from Twitter to speak to teams and drivers during the State of IndyCar meetings last month. Guerra said Ashtari’s talk stirred many inquires of her from teams looking to increase the effectiveness of their use of Twitter. Guerra expects Ashtari to be involved in talks with IndyCar's television partners on ways to best optimize the use of Twitter during broadcasts. Teams and drivers are also starting to incorporate their Twitter handles into their uniforms, car paint schemes and more. Examples include the Sarah Fisher Hartman Racing hauler that features a HUGE “@SFRHindy” on the side to EJViso (@EJViso) doing things to rapidly increase his Twitter followers. Race car drivers' nature may also help fuel Twitter growth. A driver who has half the followers of another may feel the need to pick up the pace. 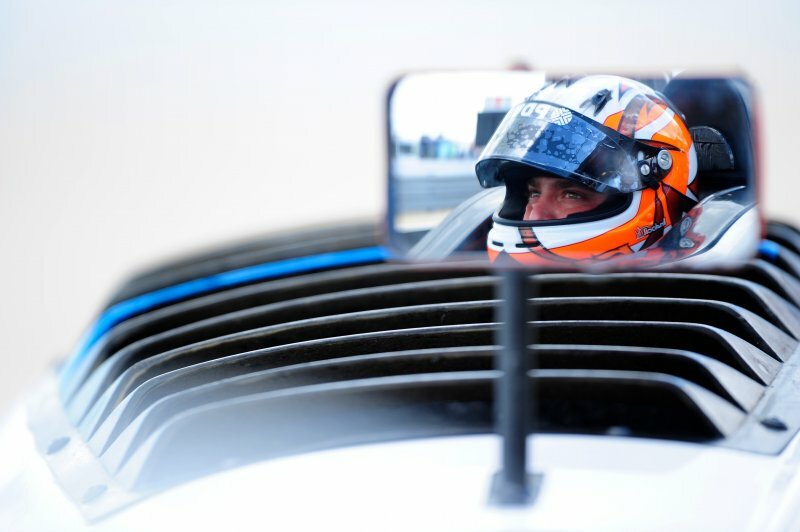 "As you well know, drivers are a very competitive breed," Guerra said. "So, yeah, it's even a little bit of that I feel. I haven't heard any Oh, man, let's see who can get to 50,000 followers first,' but maybe it's something I could push needle on." Over the last three years or so (2009), we at The EDJE pioneered posting race action blogs that featured selected comment and reaction "Tweets" with posts labeled "Tweet-By-Tweet". 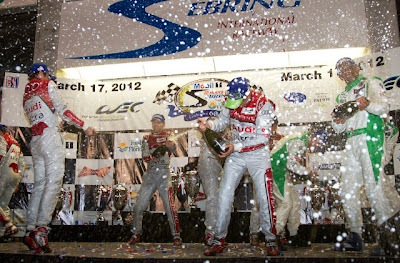 Using Twitter, Facebook, twitpic, Pinterest, YouTube, and any other New Media communications platforms that allow people to have free access to words, photos and action in realtime, of events as they happen, can only expand ones interest and fanbase knowledge with the result of a stronger experience and racing series. People experienced in using Twitter have expanded their access to message input through the use of "TweetDeck" which allows the user to set up and follow several #hashtag streams ... check it out on Chrome (download application) and a laptop. Again, what we will expect to be hearing from the PA speakers in the stands, at every 2012 IZOD IndyCar Series race venue during the season is – "Ladies and Gentlemen … start your 'Tweets'!" Lest we think there will not be the requisite number of drivers from Brazil commanding the wheel of a DW12 IZOD IndyCar Series car during the 2012 season, ever since ten year veteran Vitor Meira announced his departure from the series last month, today, nineteen year Formula One veteran Rubens Barrichello joins KV Racing Technology. Also announced today was the re-signing of fellow Brazilian, Tony Kanaan to a two-year KV Racing Technology deal. 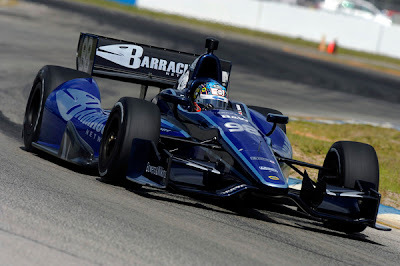 A couple of weeks ago (Feb. 11, 2012), Vitor Meira announced that he will be leaving the IndyCar IZOD Series to race back home in Brazil in the Campeonato Brasileiro de Stock Car. Brazil's premier stock car series. He has not decided if he will race in select races in the IZOD IndyCar Series or cut ties completely. The decision seemed a little sudden at the time because the first race was just over one month away ... March 25 in St. Petersburg, Fla..
Vitor's best years were from 2003-2005. During those years he finished in the top ten overall. He also had several second and third place finishes throughout his career. He missed most of the 2009 season due to injuries incurred in a scary accident during the Indy 500 which broke several vertebrae bones in his back. He made a full recovery and since his accident, he managed to secure only two top five finishes racing for AJ Foyt. One of those top five finishes occurred in 2010 in his first race back after his injury. As for Rubens Barrichello, 39, the Brazilian announced Thursday he has joined KV Racing Technology on a one-year contract. He will make his IndyCar debut at the season opener on March 25 in St. Petersburg, Fla.. Barrichello, with a record 325 races in his F1 Series career, is the biggest name to move to an American-based open-wheel series since F1 champion Nigel Mansell joined CART in 1993. Mansell won five races and the series title that season. Barrichello finished second in the F1 drivers' championship in 2002 and 2004, both times behind seven-time champion Michael Schumacher of Ferrari. "I'm loving the idea I'm going to be a rookie," he said. "That makes me young, and I'm loving that." Barrichello will participate in all 16 IndyCar races on the calendar, including the Indy 500 in May and the other four races on ovals. This announcement comes on the heels of KV Racing Technology confirming the re-signing of EJ Viso who will return to the team for a third year to compete for the full 2012 IZOD IndyCar Series season. Viso, 26, who hails fron Venezuela, will drive the No. 5 CITGO | PDVSA - KV Racing Technology Chevrolet-powered DW12 with additional support from Herbalife, Mindeporte CANTV and SBA Airlines. Barichello has been assigned the No. 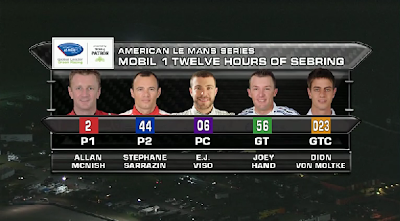 8 BMC | Embrase race car with Kanaan returning in the No. 11 GEICO | Mouser Electronics entry. "I am really happy to be back with KV Racing Technology," EJ Viso said at the announcement. "Last year was very successful even if the results don't necessarily reflect what we wanted. We worked very hard and we proved we were competitive. The progress we made over the last two years will be a key to our success in 2012." 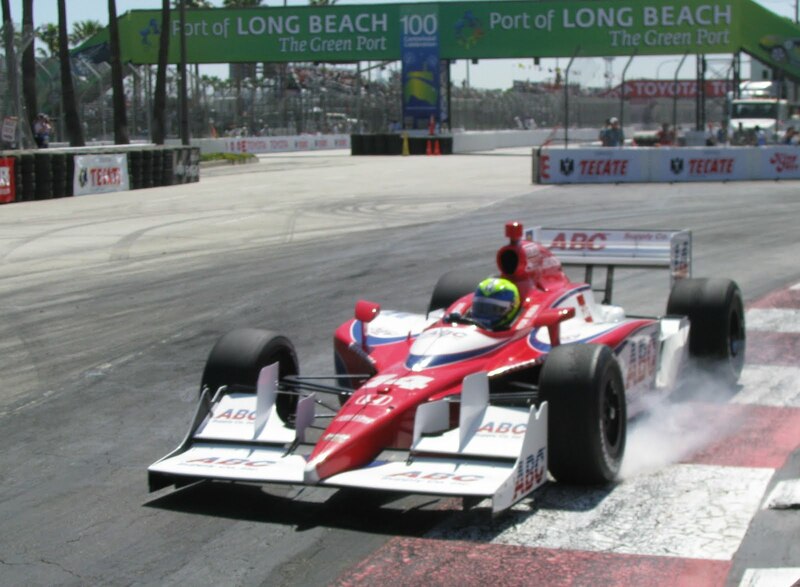 As for Kanaan, 37, the 2004 IZOD IndyCar Series champion, will be entering his 15th US-based open-wheel season. Kanaan started in 1996 with Tasman Motorsports in the Firestone Indy Lights Championship. It's his 11th Indy car season and his second with KVRT. Kanaan's driving history with the IZOD IndyCar Series is one of the strongest ... he was fifth in the standings last year, is one of the most consistent and fearless drivers in the series who has placed in the top six every year he has competed. "I am very excited to be returning to KV Racing Technology, not only with a two-year deal but also to have Rubens Barrichello as my teammate," Kanaan said. "We have always dreamed about racing together (aside from their winter kart races in Brazil) but never imagined it would actually happen and certainly not in the near future or in Indy cars. So I am looking forward to the start of the season. I think it's going to be a very exciting year." Rubens Barrichello reacted. "I am thrilled, it is something very new to me. With all my experience I will start as a rookie, but I think I will get better as the year progresses. I hope with my contribution to KV Racing Technology we can build on Tony's contribution to the team from last year and take the team to another level. I am extremely happy and have a big smile on my face." IZOD IndyCar Series CEO Randy Bernard went to one of Barrichello's test sessions to meet the Brazilian. He said Thursday it was an exciting day for the series ''and a positive step to start'' the year. "There's not a person in the world who knows racing that wouldn't tell you that Rubens Barrichello is one of the greatest drivers of all time," the series CEO said in a statement. "That will create great competition and expands our international platform." Barrichello brings with him an ardent and strong New Media fan base ... his 1.47 million followers on Twitter is one million more than Kanaan's, who leads all IndyCar Series drivers with 448,000 Twitter followers. 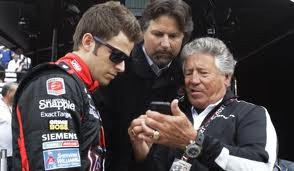 So basically, what we will expect to be hearing from the PA speakers in the stands, at every 2012 IZOD IndyCar Series venue during the season is - Ladies and Gentlemen ... start your "Tweets"!